Bouquet Gardens is World 1-2 in Paper Mario: Sticker Star. It is a grassy area with many hills and flowers. Mario learns how to use the Battle Spinner here. A Goomba Wheel attacking Mario and Kersti. Bouquet Gardens is a peaceful grassland inhabited by a few Toads and common grassland enemies such as Goombas. It is filled with beautiful flowers and a flower garden is on the first hill, monitored by a Toad. 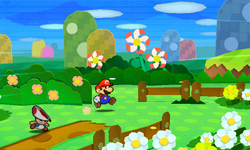 At first, Mario is unable to progress through the flower garden due to strong winds; however, later in the level, it is found that a Fan is the cause of this, which can be switched off and obtained. The blustery garden is followed by a grassy hilltop, which drops down to another slope that leads to a set of foothills that houses the Comet Piece. Eventually, a Goomba Wheel interrupts Mario, and Kersti introduces the Battle Spinner in that battle. After the Fan is obtained, Mario can return to the Toad that was battling against the strong winds to find him bawling over his ravaged garden. Mario can use Paperize to place Fire Flower or Ice Flower stickers (or either sticker's Shiny or Flashy variations) into the garden to make it bloom again. This makes the Toad overjoyed, and the grateful Toad gives Mario an HP-UP Heart. After that, the player can pick the flowers and put them in the Sticker Album. They still grow back for Toad. In the hilltop area, a red Toad is being bullied by a pair of Goombas. Talking to them gives a choice of paying the Goombas twenty coins or battling them. If the Goombas are engaged in battle, they team up and become a 2-Fold Goomba. Either way, the red Toad gives Mario a Cat-o-Luck for helping him. The outline for the Secret Door is located on the cliff before the Comet Piece. Pasting in a Secret Door sticker via Paperize reveals a hollow with the stickers Flashy Fire Flower, Flashy Ice Flower, and Flashy POW Block. This page was last edited on April 24, 2019, at 17:52.